Champagne has long been associated with luxurious living. Each sip, pure liquid luxury! The very presentation of a champagne bottle implies prestige, excellence and a cause for celebration. We love it so much here at Eat Love Savor. Why wait for New Years or special occasions? We feel anytime is a good time for champagne! Living well is a celebration and the choice beverage of luxurious living well is Champagne! Let’s take a closer look at this prestigious beverage and some of the reasons why it too is worth celebrating! Situated in the tiny French village Chigny-des-Roses owned and cultivated by the Cattier family since 1736. The name was Armand de Brignac was adopted by Jean-Jacques mother after a character she read in a novel called “de Brignac” and it was registered sometime between the late 1940’s and early 1950’s. The patriarch, Jean-Jacques Cattier, born here, oversees the operation and where he makes his family’s wines from vine to bottle, with his son and a small team of eight craftsmen. This prestigious brand of Champagne is made in limited quantities, to a high standard of excellence. In their line of champagnes is the Armand de Brignac limited Brut Gold, the Armand de Brignac Blanc de Blancs, and the Armand de Brignac Rosé. Armand de Brignac Champagne is rated the #1 Champagne in the world. Classified as Premier Cru, this special designation is given to only 50 out of 300 villages in the Champagne region by the Comité Interprofessionel du Vin de Champagne (CIVC) and the Institut National des Appellations d’Origine (INAO). This is a special champagne, from the vine to the beautiful bottle, there is luxury in every sip. Each vintage is produced in very limited quantity. 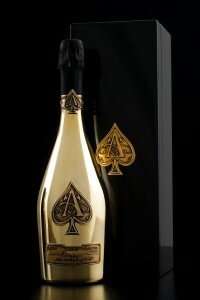 To find out where you can get some near you, go to ArmandDeBrignac.com and contact them directly. After the joy of the harvest, the grapes are pressed and the signature cuveé blend is created.A percentage of the finest harvests from years prior is added to the new harvest to ensure consistency. This traditional style using a blend of vintages preserves the character. It is the Art of Champagne and a mark of the excellence of the Champagne they bottle. Aged three years, on wooden racks to undergo “remuage” a centuries old riddling process. During this time, the bottles are turned slightly bu hand each day. This sifts out the sediment which settles in the neck of the bottle. This is done for a full month, the gradual process purifies the wine without its natural aging. Then, the bottles are partially frozen and the sediment is ejected in a process called “dégorgement”. The now aged and purified wine is now augmented with the “liqueur de dosage” a blend of fine cane sugar and a blend of the very best still wines from prior harvests. This step is what gives Armand de Brignac its unique character. Rooted in fashion, this distinctive metal bottle was conceived in the fashion house of André Courrèges. This metal bottle, too precious to put through mechanical systems is hand-bottled, hand polished and the pewter labels are also added by hand creating an aura of pure opulence. Each dazzling bottle is enveloped in a lush velvet bag stitched with the bottle’s insignia. To describe drinking this champagne it is said to be buttery soft, creamy texture and complex. Full body, light floral notes and brioche accents with a long, silky finish. Armand de Brignac, true luxury for all the senses, a totally luxurious experience.